Another Top 10 National Finish For McEachern? The McEachern Lady Indians (29-2) capped their 2013-14 season winning their second state championship in three seasons with a 81-62 victory over the Archer (GA) Tigers in Georgia’s 6A girls title game. The Lady Indians were 23-0 against Georgia teams, went wire-to-wire as the No.1 team in state polls and defeated six teams either in the regular season or playoffs that were in the final top 10 of the state polls. McEachern won their first title in 2012 with a perfect 33-0 record and finished No.2 in the final national polls. Nationally, McEachern began the season ranked No. 20 in the preseason briefly falling out after back-to-back losses in late November. They posted a 5-2 record against national opponents and have been ranked as high at No. 14 this season. They currently are No.15 in both major polls (Max Preps and USA Today). “We set up a national schedule. We went and played everybody we could play from Tennessee to Florida to New York. We’ve been everywhere trying to play the best teams in the nation to get us to this point (winning the state championship),” head coach Phyllis Arthur said after winning the state championship. Are the Lady Indians worthy of another Top 10 finish when the final polls come out? McEachern’s first lost came to Blackman (TN) 74-67. Blackman (34-1) is currently ranked No.1 nationally, won the Tennessee Division-I 3A championship and look to be in prime position to lock up the national championship. Blackman suffered their only loss to Incarnate Word Academy (MO) (27-1)-ranked No.2 nationally. Blackman revenged that loss by beating Incarnate Word Academy three weeks later. Marian Cathloic (IL) defeated McEachern the next night as one of two teams to hold the Indians under 50 points in a 47-29 victory. Marian Catholic is unranked and lost in the Illinois 4A semifinals to eventual champion Whitney Young. Whitney Young (32-3) is currently ranked as high as No.10 nationally. McEachern defeated Florida champions Ribault (FL) and Edgewater (FL). Ribault (29-5) won class 6A, Edgewater (26-6) won class 4A and both are unranked. The Lady Indians swept two games in the Rose Classic Super Jam in Brooklyn, NY defeating Nazareth (NY) and Capitol Christian Academy (MD). Nazareth (21-7) finished as the New York State Catholic School runner-up losing to St. Anthony (NY) (25-5) in the finals. Capitol Christian Academy (25-7) finished third in the NACA (National Association of Christian Athletes) Nationals. Their final national game was against Hoover (AL) in a game played at Wesleyan High School in Norcross, GA. The Indians used a 23-1 run in the first half on their way to the 75-53 victory. Hoover lost in the 2nd round of the Alabama 6A playoffs to Sparkman (AL). Sparkman lost to Blackman (TN) twice during the regular season and were the Alabama 6A runner-up losing to Shades Valley (AL). Shades Valley defeated Archer (29-4) during the regular season. The drawback for the Lady Indians is none of their national wins were against nationally-ranked opponents. Despite the national schedule the Lady Indians were 0-1 against nationally-ranked teams. Southwest Dekalb (GA) was the only other Georgia team to make it into the national polls. Southwest Dekalb (GA) was ranked No. 23 (by Max Preps) the week they lost the Georgia 5A championship game to Tucker. McEachern finished the season on 26-game winning streak and were led by a pair of juniors ranked in the top 15 in the 2015 recruiting class by ESPN’s HoopGurlz in T’ea Cooper and Caliya Robinson. Cooper (verbal to North Carolina) averaged 19.6 points, 5.8 assists and 4.4 steals this season. Caliya Robinson averaged 13.0 points, 10.9 rebounds, 3.8 assists, 3.3 steals, 6.6 blocks recording four triple-doubles this season (all with blocks). Senior Taylor Gordon (Wake Forest signee) averaged 12.4 points, 5.3 rebounds, 3.5 assists, 1.9 steals and sophomore Jada Lewis averaged 9.6 points, 3.7 assists and 2.3 steals. History is mainly unimportant when it comes to national rankings for the current season yet the Lady Indians did accomplish some historic feats this season within Georgia. They became one of only two girls teams to score 100 points or more in a state playoff game since the inception of the girls tournament in the mid 1940’s scoring 104 against Rockdale County. Early County (GA) scored 101 on the same day and were eliminated in the next round of the 2A state playoffs after being held to 39 points. 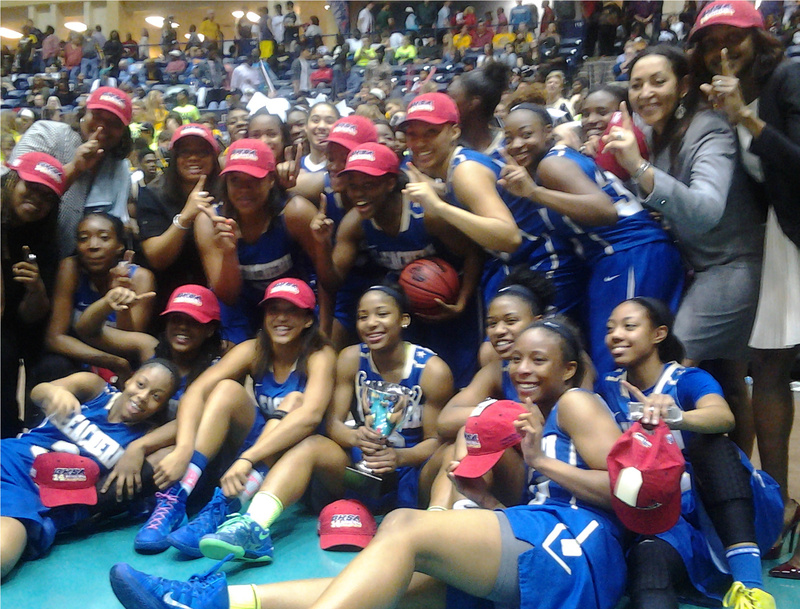 McEachern also became the first girls program from Cobb County (GA) to win multiple state championships. For the season McEachern averaged 71.6 points, scored 70 points or more 19 times (including 100 or more twice) and won five state playoff games by an average of 32.4 points. The season did not come without talk swirling around the program of recruiting and undue influence. “In spite of all the negative things said about us we still won it, they motivated us,” Arthur said. It may be a stretch for the Lady Indians to finish in the Top 10 yet as far as the Lady Indians are concerned they did their part, they played all comers and won their state. With a chuck of the team returning next season it’s safe to say McEachern will be in the national rankings to begin next season and depending on how they set up their schedule could contend for a top 10 finish and possible national championship. The nationally-ranked McEachern Indians capped their 2013-14 season with their 26th consecutive win in the Georgia class 6A championship game defeating the Archer Lady Tigers 81-62 in Macon, Ga. McEachern finishes 29-2, 23-0 vs Georgia teams and should finish inside the top 15 in the final national rankings at seasons end. Entering the contest the Indians were ranked 14th by Max Preps and 15th by USA Today. McEachern would need to overcome foul trouble and would need to rely on it’s reserves in the second quarter. Starters T’ea Cooper and Calyia Robinson each picked up their third foul eleven seconds apart with 5:11 left int he quarter forcing them to sit with McEachern leading 27-23. “We talked about how our subs may have to go in at some point. We told the subs that when you go in there you gotta keep it going. When the subs went in we said as long as we were winning it was going to be our game. They did what they had to do,” McEachern head coach Phyllis Arthur said. After Archer tied the game at 27-all, McEachern’s bench went to work outscoring Archer 12-8 to finish the first half with a 39-35 lead. KlinTisha Martin, Zieandra Bridges and Declaria Daniels all played big roles off the McEachern bench in the second quarter. Cooper and Robinson returned to the floor to begin the third quarter sparking a 15-2 run pushing the lead to 54-37. Robinson scored seven points, Cooper added a layup while Jade Lewis hit a three ball during the run. “We decided at halftime that we were gonna have to turn it up a notch because this was a very good team, well coached and they were disciplined so we had to come out and turn it up a notch,” Arthur said. Turn it up a notch they did outscoring Archer 25-11 in the decisive third quarter taking a 64-46 lead into the fourth quarter. From there they closed out the game with the exclamation point coming with just over two minutes remaining when when T’ea Cooper recovered a loose ball, led the fast break and tossed up an alley-oop layup style to Caliya Robinson for a 77-55 lead. The Lady Indians outscored Archer 16-6 in fast break points. Arthur would go back to her bench getting everyone in the game as the celebration commenced finishing off their 26th straight victory 81-62 to seal the state championship. Arthur was speaking of talk that swirled around her program all season in the way of recruiting and undue influence. McEachern (29-2) won their second title in three seasons and became the first ever Cobb County (GA) girls program to win multiple state championships since the tournament inception in the mid 1940’s. Robinson led McEachern in scoring with 20 points and grabbed 11 rebounds, blocked 6 shots while T’ea Cooper tallied 17 points. Jada Lewis chipped in 14 while Taylor Gordon-who sat out her junior season do to transfer rules, had 9 and Aunesha Williams had 8. Off the bench KlinTisha Martin had 5 and Ziendra Bridges had 4 as McEachern won the battle off the bench 13-12. “I’m overjoyed. It feels great, it feels wonderful. I am so happy especially for Taylor Gordon, she deserved it after sitting out last year because of nothing she did wrong. She could not stay in the Magnet School, she came back home which is our district and she deserved it after sitting out a whole year,” Arthur elated. Madison and Autumn Newby combined for 41 of Archer’s 62 points. Madison finished with 21 points, 3 rebound, 4 assist and 3 steal but committed 11 turnovers. Autumn put up a double-double with 20 points, 15 rebounds, 3 assists and a steal. Linsey Marchese led Archer (29-3) off the bench with 8. All of them will be returning for Archer next season. The McEachern Lady Indians advanced to the state finals for the second time in three seasons with a 64-27 victory over South Forsyth. Known for its uptempo style and pressure defense McEachern wasted little time getting out the gate fast against South Forsyth and their half court style. The Indians raced out to a 23-5 lead at the end of the first quarter and coasted to victory. T’ea Cooper has been McEachern’s leading scorer all season and was again tonight scoring a game-high 21 points. Cooper also had 6 assists, 5 steals and 4 rebounds. Caliya Robinson did her normal box score stuffing with 16 points, 13 rebounds, 9 blocks, 6 assists and 4 steals. Taylor Gordon finished with 12 points, 9 rebounds, 4 assists and 4 steals while Aunesha Williams chipped in 8 points, 7 rebounds and swiped 4 steals. South Forsyth was led by Sarah Myers’ 12 points. McEachern won its 24th consecutive game improving to 27-2 and will meet Archer (29-3) next Saturday in the Macon Coliseum for the class 6A championship. Archer defeated Lowndes 78-67 behind 29 points from Madison Newby to advance to the finals for the first time in the schools history.